Get ready to move-start packing! Repaint front door, replace kick plate, make sure doorbell works, and be sure all locks are functioning properly. As a real estate agent, nothing frustrates me more than a front door lock that doesn’t open easily. Fix it, you know it doesn’t work properly! Clean up and spruce up the landscaping beds, and flower pots at the front of the house. Look up, remove any cobwebs. Great curb appeal is essential to getting an offer. Have the carpets shampooed; wax the floors, wash the walls, windows, blinds, drapes, and lighting fixtures. Consider engaging a cleaning service, recognizing that it is a justified moving expense. Take a close look as you walk the outside of your home. Clean anything that looks dirty. Clean out your closets, box and store anything seasonal, or that you won’t use before you move to your new home. Replace or repair anything that looks loose, dingy, rusted or broken. Think in terms of a home that is sparkling clean uncluttered and spacious. Open window coverings and clean windows to let sunshine in. Replace burned out light bulbs in fixtures and lamps. Light adds color, warmth, and welcome. If you have a dark room, or space, turn a light on in that area before you leave home, everyday. You never know when you’ll have a showing! Clear off counter tops and remove clutter. Box and store all personal collections, family pictures, awards, and plaques. Clean and organize closets, dispose of any unwanted items, box and store out of season clothing and blankets. Dispose of, or store excess furniture. Don’t forget your garage, basement, and attic when it comes to cleaning. Renting a storage unit might be your best option. Put out your best towels. 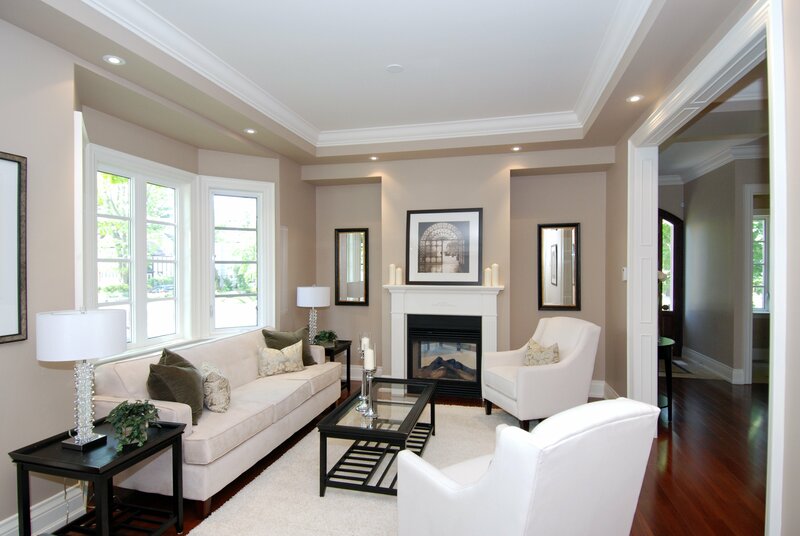 If necessary, redecorate with neutral colors in paint and carpet. Neutrals will not turn people off as some colors will. Fresh and clean is the most appealing smell potential buyers can have. Repair – Just because you’ve gotten used to the cracks in the walls and the rattles in the radiators doesn’t mean a buyer will. If you have hardwood floors that need refinishing, be sure to get it done—hardwood is a huge selling point. Buyers like to snoop around, so be sure to fix any sticky doors or drawers as well. Finally, don’t forget to address any issues with the exterior—fences, shingles, sidewalks, etc. After all, without curb appeal, some buyers may never go see the inside. Neutralize – You want buyers to see themselves in your home. If your living room has lime green shag, wood-paneled walls, and all your collectibles and personal photographs, this will be much harder for them to do. Try replacing any bold color choices in your floors and walls with something more neutral—beiges, tans, and whites. Repainting and reflooring will make everything look fresh and new, and help prospective buyers imagine all the possibilities. Stage – Once your house is clean and updated, it’s time to play dress up. Home stagers can add small details and décor touches that will bring out the possibilities in the various spaces in your home: lamps, mirrors, throw rugs and pillows, flowers, decorative soaps and towels, patio furniture. Home staging can be particularly useful if your home is especially old or if the exterior looks dated. Think of it as a little mascara and rouge—if it’s done right, you notice the beauty, not the makeup. Remember, nothing is off limits! Clear out the closets, if you’re moving because there’s no storage. Don”t send that “no storage” signal to the Buyer by having all the closets over stuffed!! Nothing sells better than the feeling of clean, well kept, its the best way to sell your home. Its the feeling you want the Buyers to leave with after every showing!